Getting a head start on spring, Gadora first spotted these pretty planters on Instructables. LilMama wants to know how to make her own flower heads… and I do loves me some succulents. 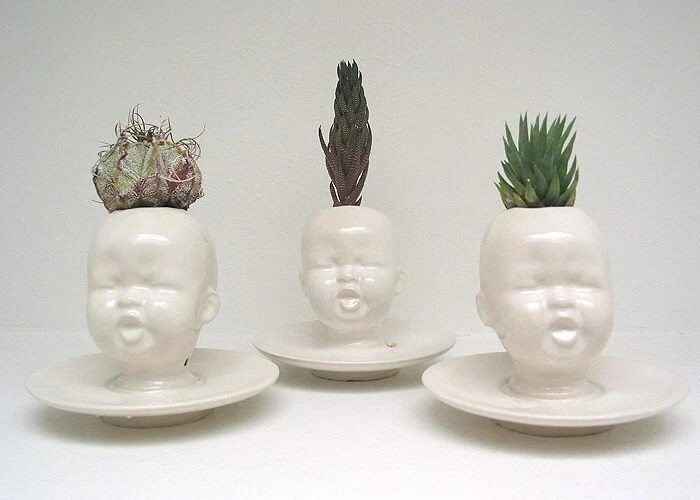 To put more ideas into your head… here are a few wicked little baby head planters in slip cast stoneware covered in a glossy white glaze by Etsy artist Michael McDowell. Check out his blog mudpuppy to see pics on how he does it. Conceptual artist Nicola L. created this 6-foot-tall aquarium-and-bar combo our of wood and plexi in 1996. The same year, she also constructed the shelved Library Head. Aquarium Head Bar, 1996, by Nicola L.
For a table top display, these “Little Joseph” hand-painted porcelain candle holders, by designer Maxim Velčovskare, are border-line creepy. But rather charming, no? For something even smaller, Gadora has her eyes on the Mr. and Mrs. Muse Salt & Pepper shakers by Jonathan Adler. 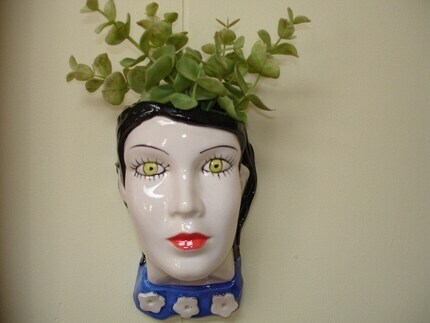 Posted on March 8, 2010 March 8, 2010 by gadorawilderPosted in MusingsTagged concrete planters, head-shaped decor, head-shaped planters. Next Next post: In praise of PINK Peeps. oh my… those stone face creations are amazing… love the jonathon adler shakers. i like the mudpuppy ones – but, melted wax on infants… i don’t know – having a hard time with that one. i think pre-mommydom i would have dug ’em. but, so it goes.